Ernesto Valverde took advantage of his side’s 11-point lead at the top of La Liga to rest everyone except goalkeeper Marc-Andre ter Stegen ahead of Tuesday’s Champions League quarterfinal second leg against United at Camp Nou. Valverde handed La Liga debuts to young midfielder Riqui Puig and Senegalese right-back Moussa Wague. Both play for the B team on a weekly basis but they didn’t look out of place on this stage. Puig, in particular, caught the eye with one brilliant pass for Dembele. Barca may even be happy with the point given the number of changes they made. They’ve still only lost three league games in 70 under Valverde and they managed to get this draw while resting their best players. Lionel Messi, Luis Suarez and Gerard Pique will have recharged batteries to face United in three days. A couple of the players who came into the side didn’t strengthen their case to play more. Kevin-Prince Boateng, playing as the lone front man, was poor, while midfielder Carles Alena was unable to produce having impressed previously in brief cameos. 7 — Valverde will be delighted to have avoided defeat despite making so many changes. The objective, as always, was to win, but he may well have sacrificed two points before the game in exchange for the rest which was afforded to his regular starters. GK Marc-Andre ter Stegen, 6 — Captained the side but didn’t have a great deal to do. Huesca only managed one shot on target. 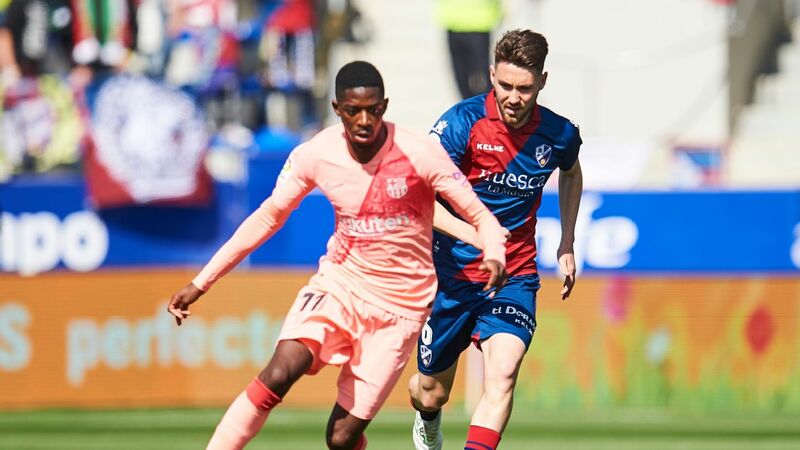 DF Jean-Clair Todibo, 7 — The January signing made his first start for Barca, excluding the Catalan Super Cup, and looked comfortable as part of a back three. Made one fine challenge late on. DF Jeison Murillo, 7 — Signed from Valencia on loan in January but has hardly been seen since. Dusted off for this game and did well. If needed in the final stretch of the season, this performance showed Valverde he’s ready. DF Samuel Umtiti, 6 — Still getting his match fitness back following months on the sidelines with a knee problem. The 90 minutes will have done him good as he looks to wrestle his place back from Clement Lenglet. MF Moussa Wague, 7 — Some nervous moments but grew into the game and was always an outlet in attack. The 20-year-old right-back could be pushing for a first-team role next season. MF Arturo Vidal, 6 — One of the experienced heads in the side, Vidal sat at the base of the midfield. Snuffed out any sign of Huesca trouble and joined in further forward when he could. MF Riqui Puig, 7 — The teenage midfielder’s rise continued with his first-ever league start, having made his first-team debut in the Copa del Rey earlier this season. Showed some nice touches, including one superb through ball to set up a Dembele chance. MF Carles Alena, 5 — Seems to play under pressure when he’s one of the more senior players in the side. Has done well when he’s played this season but this felt like a step back. Gave the ball away too often and made some poor decisions. 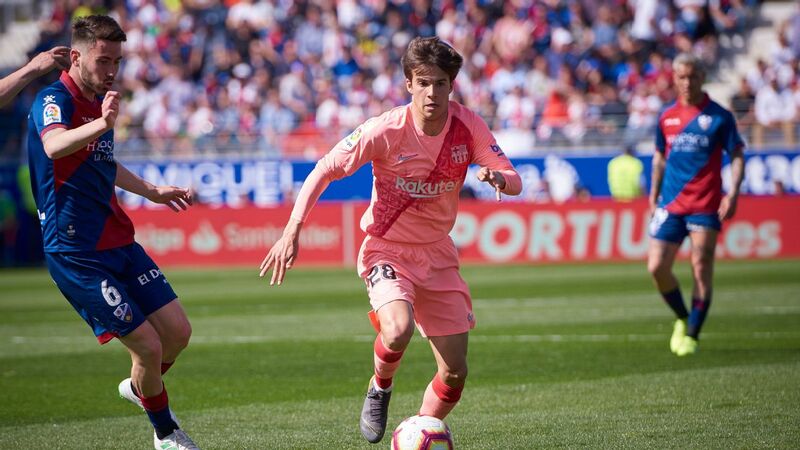 In just his second first-team appearance, Barcelona’s Riqui Puig showed why he is one the club’s most heralded youngsters. MF Malcom, 6 — Played as a left wing-back, so was slightly restricted in terms of his usual attacking role. Thumped a shot off the post in the second half as Barca pushed for a winner. FW Ousmane Dembele, 6 — The minutes were always going to be more important than the performance on his return from a hamstring problem. Was sloppy at times but always carried a threat and is now an option for Tuesday’s game against United. FW Kevin-Prince Boateng, 5 — Every time he’s played for Barca since his surprise January move from Sassuolo he has been unable to contribute in the final third. MF Jordi Alba, 6 — Came on in the second half as Valverde looked to add some more experience. MF Philippe Coutinho, 6 — Replaced Puig in midfield and saw plenty of the ball but never as high up the pitch as he would have liked. MF Arthur, NR — Introduced for Alena for the final few minutes.